Breaking news, updates, and analysis on the uprising and crisis in Ukraine. Appearing at a fundraiser Tuesday evening, President Obama spoke on the crisis in Ukraine. A lot of the focus today and over the last several weeks has been on international affairs, and I’ll be happy to give you more details of what’s happening in Ukraine. The essence of it is, is we have a country that has been in a difficult situation for quite some time, that had a President that was closely associated with the Russians, who a large segment of the Ukrainian population did not feel was representing them well, although he had been democratically elected. You had a crisis inside of Ukraine as a consequence of his decision not to sign an agreement that would have oriented their economy a little more towards the West. That got out of control and we got involved only to prevent initially from bloodshed occurring inside the country and succeeded in doing that. But, ultimately, a deal that was brokered for a power-sharing arrangement in an election led to him fleeing and we now have a situation in which the Russians I think are engaging in a fundamental breach of international law in sending troops into the country to try to force the hands of the Ukrainian people. We may be able to deescalate over the next several days and weeks, but it’s a serious situation and we’re spending a lot of time on it. In some ways, it reflects a broader trend around the world, which is authoritarian regimes, ineffective regimes -- corrupt regimes are in this age of social media -- having a much harder time clinging on to power. At the same time, in many of these societies, you don’t have strong traditions of civil society and organization that allow orderly transfers of power, and that makes for an often chaotic situation. And part of what we have to navigate -- not just this year or next year but for years to come, not just in the Middle East, but around the world -- is going to be our ability to help countries provide a voice for people who have previously been voiceless; to allow them to determine their own destiny, but to do it with some humility, recognizing that in each of these societies, we’re not going to be able to impose order. We’re going to have to work with these communities and the international community on the basis of some core principles. And the central principle is that each individual is worth something, means something -- their dreams, hopes, and aspirations matter -- and that they should have a voice in the direction of their lives and they should be able to, if they work hard, aspire to some semblance of security and prosperity. And that’s obviously a reflection of who we are as Americans. The European Union's Catherine Ashton will not be traveling to Kiev today as planned. Instead, she will be in Paris to take part in the meeting between Secretary of State Kerry and Russian Foreign Minister Lavrov. Thursday she will travel to Brussels to meet the Ukrainian prime minister. However, her office has said this is simply a postponement of her trip to Kiev, not a cancellation. Ukraine on Wednesday raised its flag over the government headquarters in the eastern city of Donetsk where a Russian flag had stood since Saturday, witnesses said. Police said they were evacuating the building, which has been occupied since Monday by pro-Russian demonstrators. A police statement said the evacuation began after reports that the building was booby-trapped with explosives. Donetsk, home city of deposed president Viktor Yanukovich, is one of around a half dozen cities in eastern Ukraine that saw pro-Russian protests erupt on Saturday just as President Vladimir Putin was announcing that he had the right to invade. Demonstrators, led by a man who declared himself "people's governor", have been holed up in the regional administration building, demanding relations with Kiev be severed and control over the police and security forces be placed in their hands. Kiev accues Moscow of organising the protests and says many of the demonstrators are Russians bused across the border to create an excuse for military intervention. "A message was received at 8:30 (0630 GMT) from an unknown person that there is a grenade in the regional council building," said Olga Pochkalova, police spokeswoman. "An investigative-operational team is checking and people are being led out of the building." Witnesses said the Russian flag on the roof of the 11-storey building was replaced with a Ukrainian flag, but another Russian flag was still flying from a flagpole in front. According to a top Ukraine security official, fewer incidents were reported in Crimea overnight, Reuters reported Wednesday morning. The security official hopes a way will bd found in the coming days to resolve the situation through talks. Ukraine's foreign minister said on Wednesday he wanted to press for a peaceful solution to the conflict with Russia. On arrival in Paris for international talks on the conflict, Andrii Deshchytsia said: "We want to say a few things to the Russians. We want to keep good dialogue and good relations with the Russian people. 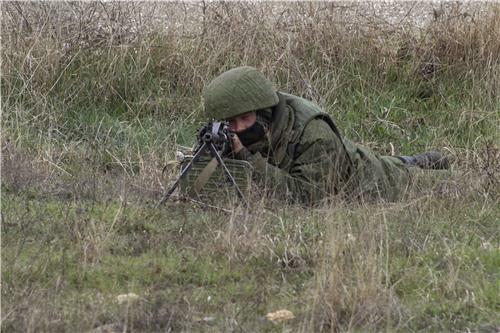 We want to settle this conflict peacefully and we don't want to fight the Russians". Russian Foreign Minister Lavorv says it is up to Crimean and other Ukrainian authorities whether to invite international observers, according to Reuters. The Ukrainian foreign minister says he wants to settle the conflict peacefully and does not want to fight Russia, according to Reuters. According to witnesses, the Ukrainian flag was raised over a Donetsk government building, which has flown the Russian flag since Saturday, Reuters reported around 3:45 a.m. ET Wednesday. Ukraine's prime minister says Russian 'aggression' is having extremely negative effects on Ukraine's economy, according to Reuters. According to a ministry statement, the Russian foreign minister told the European Union the way to stabilize the situation in Ukraine is to work from the Feb. 21 agreement, including constitutional reform that takes account of all regions' interests, Reuters reported very early Wednesday. On Feb. 22, as Ukraine politicians voted to remove their Kremlin-friendly president, a roaring crowd in another nation took on their Russian foe. The Georgian rugby team defeated the Russian Bears, 36-10, before a near sold-out crowd in their home stadium. During the lap of honor, the Georgian players held up a banner: “Sokhumi and Tskhinvali = Georgia.” It referred to the capitals of Abkhazia and South Ossetia, which like Transnistria in Moldova and potentially Crimea in Ukraine, are breakaway regions now under de facto Russian control. Russia has long tried to intimidate Georgia and Moldova out of their westward shift; Moldova is currently bleeding from a Kremlin boycott of its wine, and Georgia is still nursing the wounds of its 2008 war. But watching Russian troops move into Ukraine has only steeled the resolve of these two small nations to join Europe as quickly as possible. It has also made Western leaders more committed to making that happen. The Georgians and Moldovans remain committed to a landmark association and free trade agreement with the European Union, a step towards eventual membership, which Ukraine’s president bowed out off in November under Russian pressure, sparking three months of protest and ultimately, his ouster last week. National papers in Georgia and Moldova have touted each pledge of support for the Ukraine by Western heads of state, while eagerly documenting their own leaders’ respective meetings with American officials. Senator Lindsey Graham sent a series of somewhat odd tweets Tuesday afternoon, relating the Ukrainian crisis to the 2012 attack on a U.S. consulate in Benghazi that left four Americans dead. According to RIA, which is citing the defense ministry, Russia test-fires an intercontinental ballistic missile, Reuters reports. 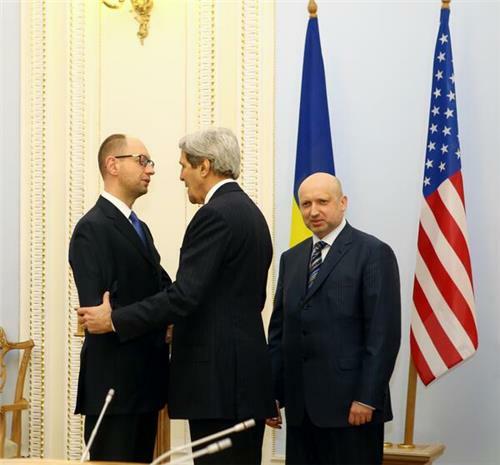 Just left Kyiv after an inspiring day of meetings with @JohnKerry and Ukrainian leaders. German Foreign Minister Steinmeier made a statement Tuesday in Geneva on the Ukrainian crisis following discussion with United Nations Secretary-General Ban Ki-moon and Russian Foreign Minister Lavrov. Russian President Vladimir Putin has been nominated for the 2014 Nobel Peace Prize - but the conflict in Ukraine is also likely to be on the Nobel committee's agenda. A record 278 candidates, including 47 organizations, received nominations for the 2014 prize, said the Norwegian Nobel Institute's director, Geir Lundestad. Committee members who met on Tuesday added their own proposals with a focus on recent turmoil around the globe. "Part of the purpose of the committee's first meeting is to take into account recent events, and committee members try to anticipate what could be the potential developments in political hotspots," Lundestad said. Russia seized control of Ukraine's Crimea region after President Viktor Yanukovich was ousted on February 22, prompting the most serious confrontation between Moscow and the West since the end of the Cold War. Pope Francis and former U.S. National Security Agency contractor Edward Snowden also received nominations as well as Putin. Pakistani teenager Malala Yousafzai, shot in the head by the Taliban for advocating girls' right to education, is also thought to be among the candidates, as are several Russian dissidents who have spoken out for human rights. Conflicts between protesters and the governments of Thailand and Venezuela are also expected to be debated by the committee. "We are getting an increasing number of nominations from people in countries that have never submitted nominations before," Lundestad said. Although nominations are kept secret for 50 years, thousands of people around the world are eligible to propose candidates, including any member of any national assembly, and many make their picks public. The committee narrowed its list to between 25 and 40 on Tuesday and it will cut its list to about a dozen by the end of April. First awarded in 1901, the prize includes 8 million Swedish crowns ($1.24 million) in cash. The winner will be announced on the second Friday of October and the prize will be presented on December 10, the anniversary of Alfred Nobel's death. Vladimir Putin had a telephone conversation with President of the People’s Republic of China Xi Jinping. Vladimir Putin and Xi Jinping discussed the exceedingly complex situation unfolding in Ukraine, noting their close positions. They expressed hope that the steps being taken by Russia’s leadership will help decrease sociopolitical tension and ensure the security of the Russian-speaking population in Crimea and Ukraine’s eastern regions. The leaders addressed some current bilateral cooperation issues between Russia and China, including future contacts at the highest level. U.S. Secretary of State John Kerry on Tuesday condemned Russia's "act of aggression" in Ukraine and said Moscow, which has taken control of the Crimea region, was looking for a pretext to invade more of the country. "The United States reaffirms our commitment to Ukraine's sovereignty and territorial integrity according to international law. We condemn the Russian Federation's act of aggression," Kerry told a news conference during a visit to Kiev intended to show support for Ukraine's new leaders. "It is clear that Russia has been working hard to create a pretext for being able to invade further," he said. U.S. President Barack Obama said on Tuesday that Russian President Vladimir Putin's aggression in Ukraine is not a sign of Russian strength but rather a reflection of the deep concern Russia's neighbors have about Moscow's meddling. In remarks to reporters, Obama ridiculed Putin's reason for sending the Russian military into the Crimea region of southern Ukraine. Putin said the move was aimed at protecting Russian nationals but Obama calls the incursion a violation of international law. 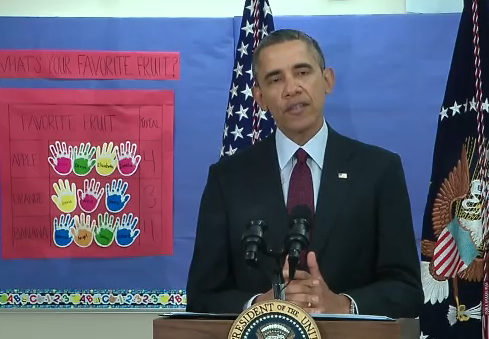 "President Putin seems to have a different set of lawyers making a different set of interpretations," Obama said. "But I don't think that's fooling anybody." Obama said he held a meeting of the National Security Council on Tuesday morning, his second such session in two days about Ukraine. 3rd emrgcy @OSCE session on Ukraine in as many days-- Russia continuing to say its massive exercises completely coincidental to #Ukraine . Kerry concludes: "There is potential for a strong relationship between Ukraine and Russia ... but not a relationship that precludes the full sovereignty and territorial integrity of the nation of Ukraine being respected." 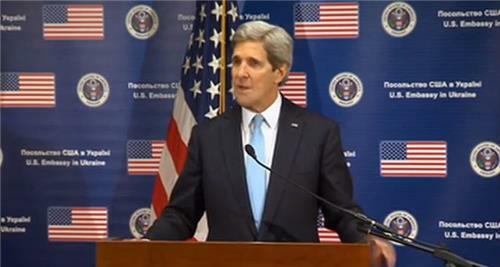 Kerry: "'We would like to see this de-escalated. We are not looking for some kind of major confrontation. Let's find a path forward." They are currently scheduled to have elections in May and everybody in the international community should be invested both in halting the economic deterioration and ensuring the elections happen, Obama said before leaving the press conference. Kerry says that he spoke directly to Putin today and invited him to engage in "legitimate, appropriate dialogue" with the current government in Ukraine. I actually think this has not been a sign of strength, Obama said, adding that he believes this will push many countries away from Russia. Strong words from Kerry on Putin in Kiev: "Russia has no right to come into Ukraine and tell people, at the barrel of a gun, how to act. That is not 21st century G-8 major nation behavior." At his budget press conference, President Obama said he hasn't spoken to President Putin since they spoke over the weekend. However, Secretary of State Kerry is in Kiev at President Obama's direction expressing the Obama's administration 'full support' for the Ukrainian people. Kerry smirks when told be a journalist that Putin had denied that Russia had a military presence in Crimea. "He really said there were no troops in Crimea?" "The United States will stand by the Ukrainian people as they work to build the strong, democratic country they deserve," Kerry concludes. "We must all step up and answer their call." Kerry offers Ukraine a package including a $1 billion loan guarantee to support the Ukrainian economy: "We will provide the best expertise available to help Ukraine's economy and financial institutions to quickly repair themselves." "I come here today at the instruction of President Obama to make it absolutely clear that the United States would prefer to see this deescalated," says Kerry. "If Russia does not choose to deescalate, then our partners will have absolutely no choice to to join us and to continue steps to isolate Russia politically, diplomatically, and economically. This is not something we seek to do. This is something Russia's choices force us to do." Kerry reiterates Pres. Obama's call for Russia to pursue a diplomatic solution with the UN or OSCE as an international mediator. Russia would have you believe that Kiev is trying to destabilize Crimea, says Kerry. "Not a single piece of credible evidence supports any one of these claims. None." "It is diplomacy, not unilateral force, that can best solve disputes like these in the 21st century," says Kerry. "There is a better way for Russia to pursue its legitimate interests in Ukraine." Kerry seeks to debunk the Russian narrative of how Ukraine's uprising came to be, blaming Yanukovych for the collapse of the February 24 peace agreement. "He broke his obligation to sign that agreement and he fled into the night," says Kerry. Kerry: "We condemn the Russia Federation's act of aggression. We have, at this moment, evidence of a great transformation taking place, and we stand with Ukrainians in that transformation." Kerry adds: "In the hearts of Ukrainians and the eyes of the world, there is nothing strong about what Russia is doing." 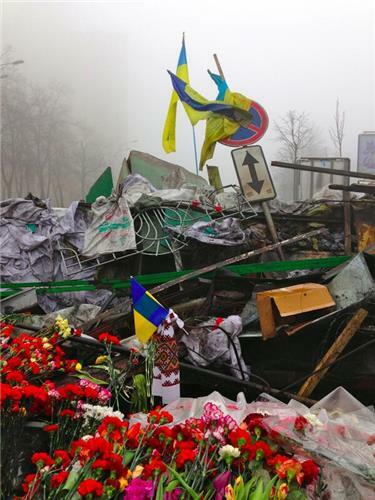 "The United States extends it's deepest condolences to those whose grief is very fresh," says Kerry, speaking of his time walking through the street of Kiev after arriving in Ukraine this morning. 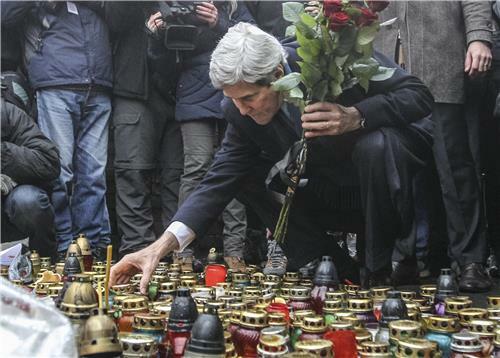 The freedom these brave Ukrainians fought for, says Kerry, "will not be stolen by bullets or invasions." Secretary of State John Kerry is now speaking to the press in Kiev, Ukraine. Watch live on Al Jazeera America.